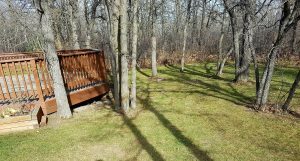 Green Thumb TLC has been serving the Steinbach area since 1988. Richard has been working for the company since the inception, and bought the business in 1996. Some of our loyal customers have been with us for 25 years. Green Thumb started out as a grass cutting business and has grown into a full service lawn maintenance company. In my early years I took an arborist course and later I became fully licensed and insured to apply chemicals and fertilizer. Due to Phosphorus ban, we are no longer able to apply it onto lawns. The only exception is seeding a new lawn or over-seeding. As of 2015 a Pesticide ban came into effect. We are no longer able to apply Par III to lawns. Fiesta is the only product on the market at this time that can be used on lawns. I had been experimenting with the bio chemical for some years already and have used our own lawn as a trial area before using it on our first customer’s lawn in 2014. We think environmentally, recycling grass when we can. If we cannot recycle and mulch the grass on-site, we collect it and haul it to our compost site. We allow the compost to reach 160 F before turning it, thus killing the weed seeds. We mix shredded paper, thatch and kitchen scraps into the compost. The finished product is sifted to ¼ inch with a Trommel screen on-site. W e are a full-service lawn maintenance company serving residential and commercial clients. This includes fertilizing, weed control, core aeration, power raking, and shrub & hedge trimming. Residential starting at $50 per cut. Grass clippings are 80% water, and also have a third of the fertilizer your turf needs. Mulching doesn’t cause thatch buildup! Excessive watering and fertilizer do. We mulch a third of the residential grass we cut. 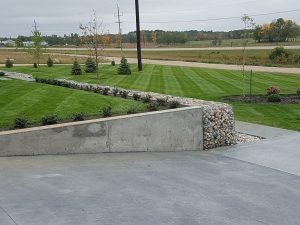 Trimming along a driveway, sidewalk or a dirt edge. $1.50 per foot. Power raking helps reduce the thatch in lawns, it also cuts roots making grass thicker. It reduces the risk of chinch bug infestation. 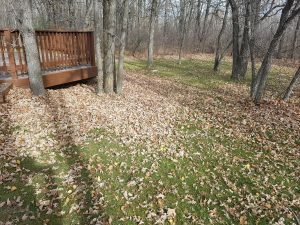 Cutting down some shrubs, blowing leaves from beds, and dethatching. Core aeration pull plugs out of the ground allowing air, water and nutrients into the root zone. The cores break down easily with weather and mowing. Starts at $90. 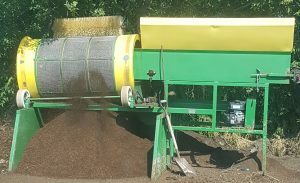 Compost applied after aeration gives the grass a natural slow release feeding, seeding grass into the compost allows the existing grass to get thicker which reduces weed infestation. 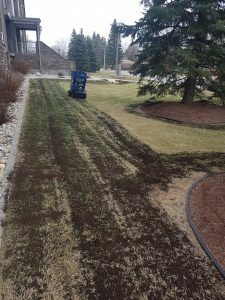 When over-seeding, it is recommended to use a starter fertilizer. Starter fertilizer contains Nitrogen, Phosphorus and Potassium. Phosphorus, due to a ban, cannot be applied to lawns unless you are seeding new grass or over-seeding. Top dressing is done in spring or fall. But not when it is very hot. The average yard under 10,000 square feet starts at $80 per application. A well balanced fertilizer 30-0-08 or 33-0-11 or 28-0-10 are good fertilizers to use. The middle number 0 is Phosphorus, due to a ban it cannot be applied to lawns unless we are over-seeding or starting a new lawn. Starts at $275 for two applications of Fiesta in spring. a third fall application would be extra. Turf looks better if the weeds are taken care of. Grass doesn’t need to compete with anything.When? Spring is the best time, as Fiesta works best in cool weather. 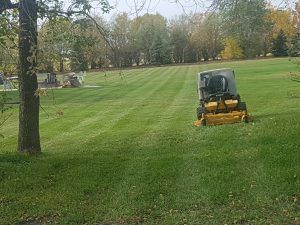 A third application in fall just before a killing frost also works well.What Product?Fiesta is an Iron-based bio chemical which helps the grass green while suppressing weeds. Fiesta is the only product we can use on lawns due to a Pesticide Ban which came into effect last year. It isn’t as effective as it only eradicate top growth, but two applications 21 days apart destroys the plant. Fiesta dries in 2-3 hours, same day visible kill, no odor, reseeding in a day, kills weeds not lawns. 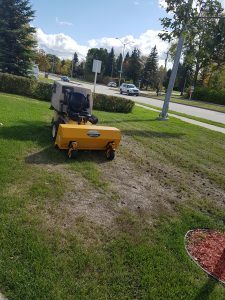 We are Licensed and insured for weed control and have a truck mount sprayer. We use a bio chemical Fiesta, spraying the lawn twice in 21 days to suppress weeds. Fiesta works quickly turning the dandelion brown the same day as spraying. 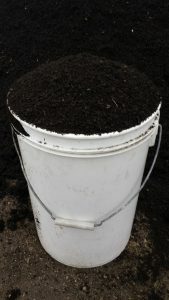 In order to make compost you need Nitrogen and Carbon or Greens and Browns ratio of 30:1. The carbons are leaves spring cleanup grass, paper. 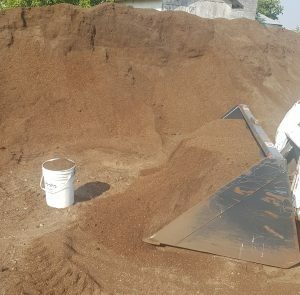 The Nitrogen is Green grass Compost for sale sifted down to a quarter inch. $60 a yard or can be sold by the 5 gallon pail.